This years Clondalkin St Patrick’s Day Parade took place for the first time in 17 Years in Clondalkin Village. Cllr Timmons (Ind) said ‘’a small dedicated committee worked tirelessly to bring this event back into Clondalkin village. The community spirit and excitement was evident throughout the parade. This was Clondalkin at its best and the feedback has been extremely positive. This event showcased many local groups and businesses. Next year for 2017 it will continue to grow”. Committee met periodically during 2015 and then from January weekly, uo to and including the week of parade. Two meetings were held in the Towers GAA club in advance of parade to provide information and steward training for both volunteers and parade participants. Information was also shared via Facebook page (3,510 Likes) (https://www.facebook.com/ClondalkinStPatricksDayParade/) and Parade Website (http://www.clondalkinstpatricksfestival.ie/details/) The Clondalkin Echo and Clondalkin Gazette ran regular updates stories on the Parade. Email were sent to schools and clubs re Parade. Colette Gallagher Placement officer – Clondalkin South Dublin County Volunteer Centre provided 7 Volunteers for the day. We had over 40 volunteers from the local community on the day as stewards. we also had 10 people dressed up as characters giving out lolly’s to kids. Clondalkin native and RTE presenter Mary Kennedy was grand marshal for Parade 2016. 32 Groups took part and this included over 700 Adults and Children. Based on Garda estimates the parade was watched by between 8,000 to 10,000 people approximately. There were no incidents of anti-social behaviour or any medical emergencies. Clondalkin An Garda Siochana, the Order of Malta and the Irish Red Cross (With ambulance) were in situ to assist as needed. Cllr Timmons represented Mayor Holland. Musical entertainment was provided from 2:30 by Finbarr Coady who compeered the event. A local girl Aoife Mc Cormack aged 12 played the violin before and after the event. Mr Darren Corrigan read the Proclamation before the parade started. 10. Boom Variety Stage School. Clondalkin Tidy Towns performed a clean up before and after the parade with refuse sacks and litter pickers. Greyhound provided bins for the event that where spread across the village. They also performed a road clean after parade. Brian Mc Elroy – Funeral Director sponsored €800 specifically for prizes and 4 x €200 was allocated for 4 Prizes. Massey Brothers sponsored a beautiful old car to bring our grand marshal around the route. The 2016 Clondalkin Patricks day parade has the potential to be a great family day out, after a small parade in Corkagh park we are very hopeful of a village parade this year. Cllr Timmons said that after a lot of meetings the parade will now go back to clondalkin village after a long absence but obviously for this to happen we need help. Cllr Timmons (Ind) said ‘’ we need to get moving if a Parade is going to Happen In Clondalkin in 2016 – we need Volunteers for many different roles , we need groups , clubs and organizations to take part , we need music , we need people to dress up , we need sponsors , we need help if parade1916 is going to happen in Clondalkin. Please think about what part you can play and let us know asap. 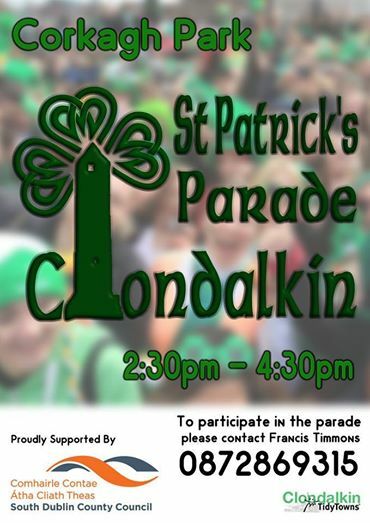 We also need volunteers to dress as various characters to make the parade colorful and a great family day out.’’ Contact Cllr Francis Timmons @ https://www.facebook.com/ClondalkinStPatricksDayParade or Phone 0872869315 , This has the potential to develop into an important annual Clondalkin family event. The parade website is at http://clondalkinstpatricksfestival.ie/ where you can register under different headings. The Clondalkin St Patrick’s day parade was re-started by Cllr Francis Timmons after a number of years. He got a group of local people together to work on the day. The timeframe for organising the day for 2015 was only 6 weeks due to a delay in securing the grant. This time limit had a big effect on what could be achieved this year. The committee met with Clondalkin Festival , Áras Chrónáin and some other local groups and hopefully they can get on board for 2016. Unfortunately some groups cancelled beforehand and some did not show up on the day which was disappointing but the ones that took place where very enthusiastic and enjoyed taking part. Others were committed well in advance. There was a large number of Volunteers (Local people and local group Clondalkin Localise) that helped out on the day, First Aid provision (Clondalkin Order of Malta) was more than adequate for the day. There was live music (all provided by local talent free), free soft drinks and treats and free face painting. There was a conscious decision made by the committee to keep any costs down for struggling families. There were mixed reviews of the Day but you couldn’t argue with the attendance which was estimated to be in the order of five thousand, which proved the need and potential of the event. The Facebook page and committee got a lot of feedback and this has been noted by organisers. The celebration was supported by the Community Department with a grant of €4043.00. The committee have met and reviewed many aspects of the day and made plans of action for 2016. At this meeting it was agreed we would meet a SDCC rep and local Guards. There were problems with the route with paths not wide enough and difficulty moving people off them to allow the participants to march. Cllr Timmons said next year we will be using the Cycle Track , it was also suggested that set down entertainers and a more of a festival event could work well. Only two ice cream vans and one that ran out of stock very quickly, need more vans with tea and Coffee. SDCC would not allow us bring in any. Any in park must be licenced by SDCC. How and where things were located (stand/stage, start of parade, not allowed on grass by SDCC). Also location of free things needs to be looked at. The Gardai reported that the only difficulty that they experienced was related to traffic but that it was dealt with easily enough, there was no public order incidents at all on the day and that the four Gardai allocated to the event were pleased with how it went. Funding would have to be sourced from local business or through fundraising events. Donal said that budgets are decided on an annual basis so it was not possible to guarantee an amount of support for next year. He also suggested that a budget of at least €10k would be required to ensure the event was worthwhile. The Gardai said that the event in the Park was very manageable but that there was a lot of demands on the Gardai on that day with people needed in town and other areas so that would need to be borne in mind. The committee will continue to meet and work on next year’s parade, A website (www.ClondalkinStPatricksFestival.ie – Not Live yet) for volunteers to sign up, ideas , information and participants to register will be launched in September and plans for March 17th 2016 be launched as well. The website will also have a submit suggestions section. The theme for next year will be ‘1916’ A lot of the ground work for 2016 has been laid and the committee have decided to engage with several groups and organisation and local reps to get ideas to improve the day. The Health and Safety work is laid down. Clondalkin active retirement group has pledged to support and help develop the day and a representative has joined the committee. Also Clondalkin Tidy Towns have committed to supporting the day and a representative has joined the committee. Good News we will be launching a website soon that 1) people will be able to volunteer on , 2) groups , organisations and businesses will be able to sign up to take part on 3) People can give suggestions on how to make it better on , 4) regular updates on progress and plans for 2016. Also The committee will meet soon and review all the positive feedback and suggestions and come up with a plan for 2016 to make it bigger and better. Parade will be 2.30-4.30 on 17th in Corkagh Park , open to all organisations and local groups contact me if you want to take part. The Clondalkin St Patrick’s day committee are working on plans for 2015 we need any interested group to email there interest to clondalkinpatricksparade@gmail.com before Friday 24th October – Please state 1) name of Group 2) type of group 3) Numbers in group and volunteer numbers and 4) contact details. At this stage this is just to see how many groups/people are interested in taking part. Also email if you can volunteer.